We discover the varied and beautiful scenery of Tuscany with a rewarding ride between two incredible cities. From the Leaning Tower of Pisa we follow the Serchio River to the charming walled town of Lucca, riding on country lanes to the birthplace of Leonardo in Vinci before arriving into the Renaissance city of Florence. We start our trip in Pisa and for those who arrive early today there is time this afternoon to explore the narrow streets, pastel coloured houses and churches of this historic town. There may also be time to ascend the leaning tower to enjoy the views. We will meet at our hotel for a welcome briefing and bike allocation, before heading out for our first evening meal together (not included). After breakfast we start our first ride, heading out from Pisa to explore the countryside of the Colline Pisane region on a picturesque circular cycle route. We follow the old Pisan Aqueduct out of the city before heading into the hills for a scenic ride towards Calci. On arrival we have the chance to see the National Museum of Certosa and the Romanesque church of San Emolao provided they are open. With rested legs we continue towards the villages of Buti and Vicopisano, before starting our return journey back towards Pisa, following a cycle path along the banks of the river Arno. The rest of the day is free for you to enjoy a glass of Chianti, relax or explore Pisa. No support vehicle today. Our total cycling distance today is approximately 35 kilometres (total 240 metres ascent). Leaving Pisa this morning, we first cycle along quiet level roads to Pontasserchio and then from here we cross the River Serchio, and skirt the base of the hills across to Massaciucolle Lake. Here we have free time for lunch and an optional short walk in Lipu wildlife reserve on the edge of the lake. Back on the bikes, we ride through low forested hills to Balbano and Nozzano Castello where we will meet up with our cycle route that is in part a gravel track, this follows the River Serchio. 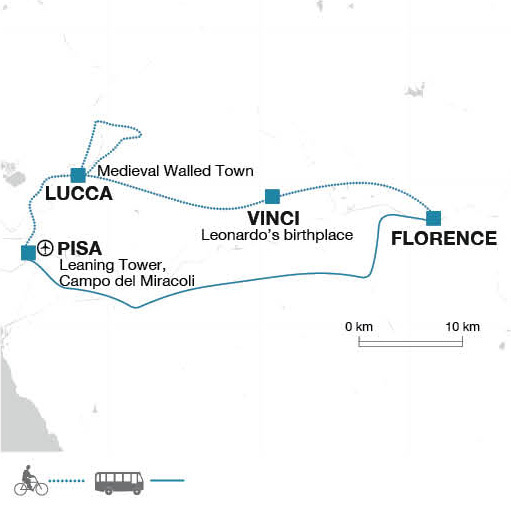 Travelling along this path we pass through the fluvial park of the Serchio and arrive into the great Tuscan walled city of Lucca. Arriving at the Pont San Quirico we will then turn towards the city and ride into the centre of Lucca and head up onto the famous walls which encompass the old town of Lucca. We complete a full circuit by bike (nearly 4km in length) then we will have a short cycle tour through the city, passing the Amphitheatre Piazza and main historical sites before arriving at our accommodation for the night. After settling into our hotel there is some free time before we meet up for an included pre-dinner wine tasting in the amazing cellars of Vanni Enotecca. Today's ride is accompanied by a support vehicle. Our total cycling distance today is approximately 40 kilometres (total 110 metres ascent). Today we will explore the scenic area that surrounds Lucca and visit one of the grand villas to be found here. We start cycling directly from the hotel, re-joining the Serchio bike path to ride as far as Ponte a Moriano. After crossing the Serchio River here we cycle along lanes following the Bio Giro bike route through the Luccan hills and past historic grand villas, such as Villa Napoleon. Continuing through the small town of Marlia we pedal along lovely backroads, passing olive groves that make the oil for which Lucca is famed, as well as vineyards producing Colline Lucchese wine. Our route takes us through many small villages and towns such as Segrominio in Monte before arriving at Colle Bordocheo, where we have included a wine and olive oil tasting to try local produce. We then ride on to Villa Torrigiani, where we stop for an optional visit of this magnificent 16th century villa and its ornate gardens. From here it is an easy ride back into Lucca along the Via Delle Ville, taking a nice quiet route back into the city. No support vehicle today. Our total cycling distance today is approximately 37 kilometres (total 280 metres ascent). Our ride from Lucca today is slightly more hilly with some gradual ascents and relaxing descents. We initially follow the Nottolini Aqueduct from Lucca towards Pieve di Compito, famed for its Camellias and annual flower festival, then along country roads through pretty villages, stopping for a morning coffee en route. Later we ride alongside the Fucecchio Nature Reserve, one of the largest inland wetland reserves in Europe with lakes and marshes covering around 1,800 hectares. The wetlands are home to hundreds of bird species and protected plant life and play an important role in the annual migration of birds through the continent. Picturesque Tuscan country roads then take us the rest of the way into Vinci, arriving in time to explore the hilltop village and its museum dedicated to Leonardo da Vinci (optional). Today's ride is accompanied by a support vehicle. Our total cycling distance today is approximately 48 kilometres (total 305 metres ascent). Leaving Vinci this morning on our bikes, we pass through more classic Tuscan countryside seeing vineyards, peaceful olive groves and small terracotta villages. Then our route follows the River Arno valley course, with the final section of this ride travelling along the River Arno cycle path to then pass through the Parco Le Cascine and into the heart of Florence, cycling through the historic centre to our hotel. Florence is the spiritual home of the Renaissance and is considered to be one of the most beautiful cities in Italy. It is a city of superlatives: from the Ponte Vecchio, the oldest and most famous bridge in Florence and the only one that was not demolished during the German retreat of 1944, to the religious centre of the city and the Cathedral of Santa Maria del Fiore with its giant dome or 'duomo'. Close by are other artistic wonders, including the Baptistry, the East door (called the Gate of Paradise by Michelangelo) and Giotto's famous bell tower, as well as the Piazza della Signoria. We will have time in the afternoon to explore Florence and visit some of the world famous landmarks such as the Duomo and the Ponte Vecchio. Today's ride is accompanied by a support vehicle. 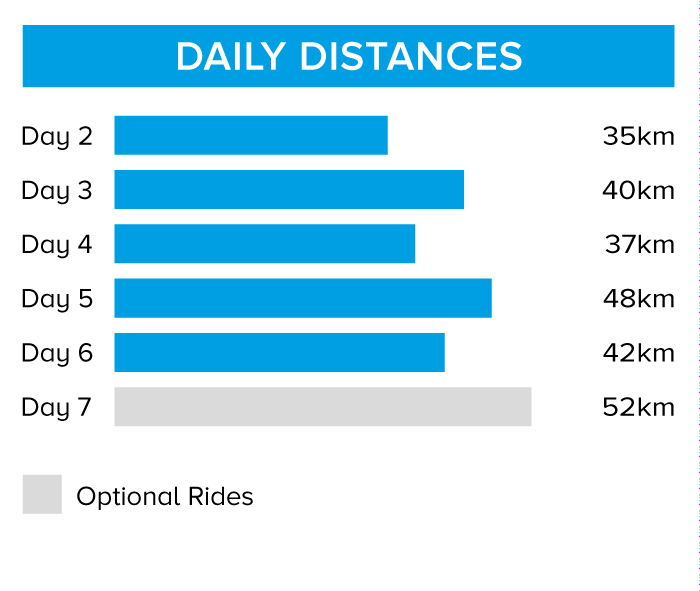 Our total cycling distance today is approximately 42 kilometres (total 365 metres ascent). Today is free to spend time exploring the wonderful city of Florence. Perhaps take time to visit the Uffizi Gallery or peruse the interesting streets on foot. There is the option for a self-guided moderate grade cycle ride into the famous wine growing area of Chianti Classico, journeying to Impurneta and Greve in Chianti. The route from Florence to Impruneta does climb quite steadily but allows one to enjoy far reaching views back across the city of Florence. An easier section of road takes you to Strada in Chianti. From Strada, the road again climbs with a steep section over a pass followed by a long descent into the heart of Chianti and its main town - Greve in Chianti. You can return by the same route to Florence. Alternatively there are easier self-guided rides in and around Florence that the Tour Leader can explain. An alternative option is a day trip to Siena by train. No support vehicle today for the optional ride. Our total cycling distance today is approximately 52 kilometres (total 605 metres ascent) (optional). The trip ends this morning after breakfast in Florence. If you are flying from Pisa Airport today, Explore will organise for your transfer direct to the airport by public shuttle bus with a journey time of around 70 minutes. Florence - Uffizi and Academia GBP 10 per person. Please note that these tickets should be bought in advance to be sure of entry (GBP 3 fee). This can be done online at www.uffizi.com. The earliest entry time you should book is 11:30 and anticipate leaving Florence at about 17:00 for your return to Siena. Your tour leader can help you book via telephone whilst on tour - although this method is slightly cheaper please note that the tickets may be sold out. Leaning tower of Pisa - 18 Euros. Cathdral Florence - Torre Guinigi Lucca - 4 Euros. Villa Torrigiani : 12 Euros. During the day you can expect to wear T-shirts and shorts. Bring long trousers, long-sleeved shirts and a fleece for cooler days and early, late season. Lightweight rain-wear for occasional rain. Italy: Visas are not required by UK, Australian, New Zealand, US and Canadian citizens. Other nationalities should consult their local embassy or consular office. You should confirm all visa related questions with the relevant Embassy prior to departure. On this tour we cycle 202 km over five days (an average of 40 km per day). The terrain is mostly rolling Tuscan hills and plains. The first two rides follow river paths and are fairly level with gentle undulations. As we leave Lucca the rides have more ascents passing through small villages and hamlets as we get closer to Vinci and Florence. We cycle on tarmac roads (90%) and gravel paths (10%). A support vehicle accompanies the rides on days 3, 5 and 6. We have graded the route as easy to moderate. Your included bike is an 27 gear Focus Black Hills mountain bike with hybrid tyres and lockable front suspension and will be the correct frame size for your height. A water bottle holder and small (2l) handlebar bag is included as well as the facility to fit your own pedals or saddle if you wish to bring them. A support vehicle accompanies the rides throughout the tour except on the optional rides. We provide spare parts and take care of the day to day maintenance. All you need to bring is your own helmet.